The Holy Sacrifice of the Mass is the center of Catholic life and is our continuing source of sanctifying grace. For this reason then, the altar is the very reason of the existence for the church. The altar in fact mystically represents Our Lord Jesus Christ, Who is the Sacrificial Victim and our intercessor with God the Father. The most sacred object in the church is the Blessed Sacrament. The second, is the consecrated altar. In Apostolic times, the altar in the domus ecclesiae or house churches was often a wooden table as at the Last Supper. In fact, the cedar table that Our Lord used for the First Mass during the Last Supper in the Upper Room is preserved in the Blessed Sacrament Chapel of St. Peter’s Basilica. In ancient times, altars were also constructed of metal, such as of gold and silver, though the use of stone eventually became the norm. The construction of a permanent altar out of stone was being legislated as early as the 6th century, though this was universal for the Roman Rite until 1596 per the Pontificale Romanum. Till about the 11th century, wooden altars were still being used and even consecrated with holy oils. From the earliest time of Christianity, the bodies and memories of the martyrs were honored in the catacombs or cemeteries with the celebration of their die nativitatis or heavenly birthday. Once the Catholic religion was legalized in the Roman Empire, the practice of placing an altar over the remains of a martyred saint gradually developed. 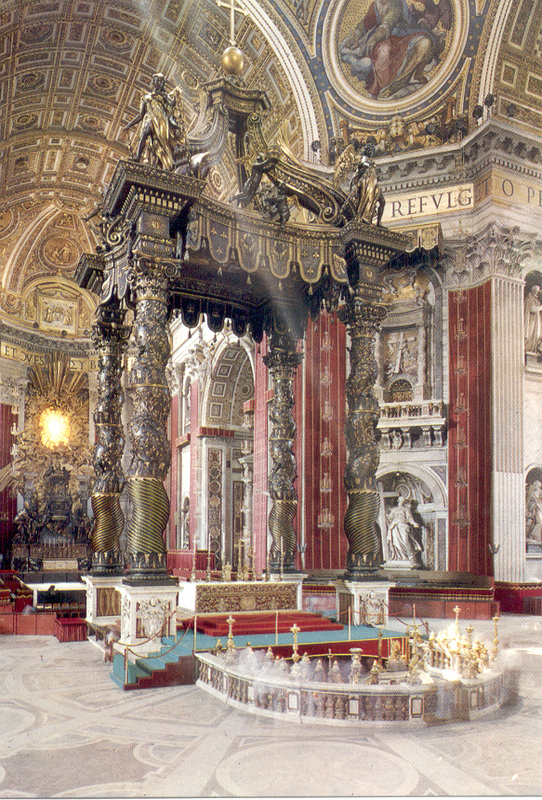 This is exemplified by the high altar in St. Peter’s Basilica which is situated directly over the tomb of the First Pope. 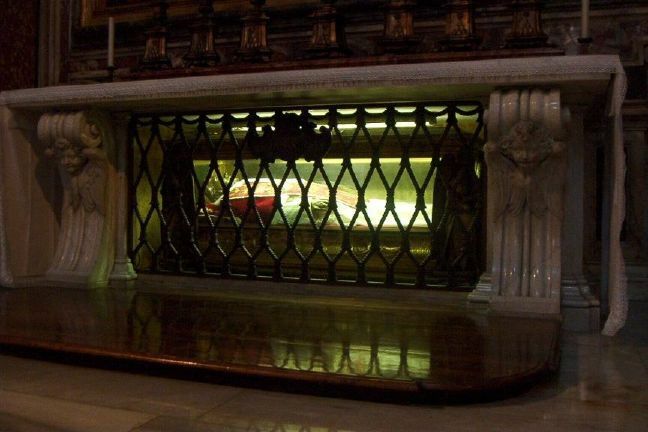 Later, it became more customary to place the relics of the martyrs within the altar itself, sometimes behind a metal grate that allowed one to view or even access the holy remains. This intimate and physical connection of the martyrs with the altar, signifies the bond that exist between those who shed their very blood for Christ and their Crucified Savior. This also beautifully fulfills the vision of St. John the Apostle as he related in the book of the Apocalypse, “…And I saw under the altar, those who were slain for the Word of God”. Centuries later, a liturgical law was made in the Latin Church of the practice of enshrining the relics of a martyr within the altar. This sepulcher, a type of sealed tomb, can be located either within the altar structure or in the top of the mensa which is Latin for table, referring to the flat portion or top of the altar. The rite of consecrating an altar includes the ceremony of sealing the relics of the saints in the sepulcher but before this takes place, preparatory steps must be done by the bishop. 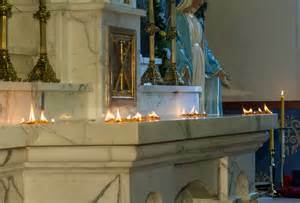 The reliquary of the martyred saints is taken to a special place, usually a chapel, where a vigil of veneration is made to the enclosed saints throughout the night as a type of funeral wake. The next morning, when it is time to consecrate that altar, the relics are born in procession on a bier by four deacons vested in red dalmatics. Red, for the blood they shed, and carried as if in a funerary procession, though with a tone of triumphant victory as the saints have received their eternal crown. Ideally, along with the rest of the church building, the high altar should face east so the Holy Sacrifice may be offered in that direction, as has been done since ancient times. The altar should also be constructed so that it is freestanding and not fixed against a wall. 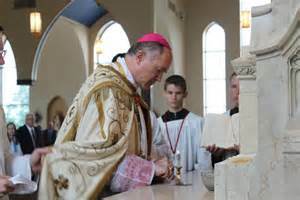 Its prescription for the construction of an altar is implied in the Pontifical Romanum which directs the bishop to anoint the back side of the altar during its consecration. This could not happen if placed against a wall. A freestanding altar allows the celebrant to circle the altar while incensing it, thus venerating the entire structure of the altar, which represents the body of Christ. With this symbolism in mind, this form of the altar better corresponds with that of a tomb or sarcophagus.